TxMotion Pedelec bike is a bike with electric extra push that assist you only when you pedal. TxMotion integrates the ordinary bike with our smart controller/sensor/hub motor, and Li-Lion Battery to let you turn on Pedelec function by one switch seamless transition, and the assisted power is controlled by your free will, there is no need to have an additional panel setting manually. Whatever you take TxMotion Pedelec Commute Bike/City Bike/Road Bike, you can enjoy happy commute without sweating and exhausting in the traffic to work, and make you easily ridding, sporting, speeding, climbing and trekking with more fun and excitement. Wherever you go, the long cruising distance per charge and easy ridding allow you to have more freedom and discovery. 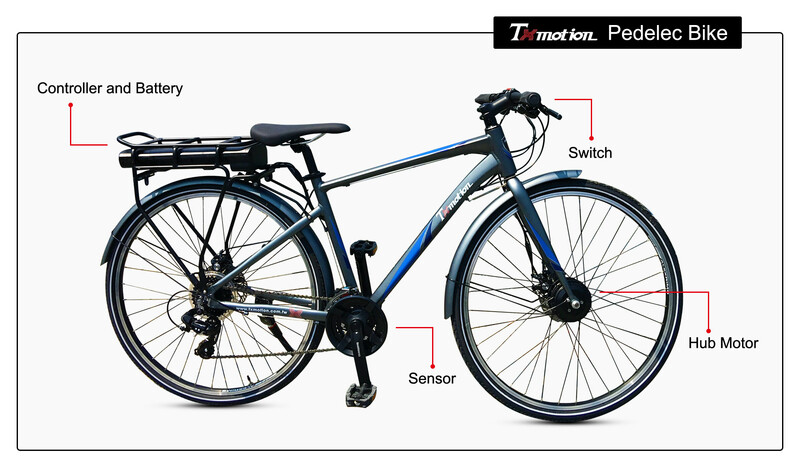 No change of bike frame, the Txmotion smart controller with hub motor is designed to integrate into bike frame to preserve the original design concept. One button to turn on Pedelec, and the intelligent power-assistance pedaling is perfectly in harmony with your regular bicycle riding habits. Even with Power-assistance, the Txmotion smart controller allows you to control the speed pattern by your free-will. No need to use panel setting manually. When Pedelec function is off, you still can enjoy normal biking as usual, no any side-effect from the motor gear.